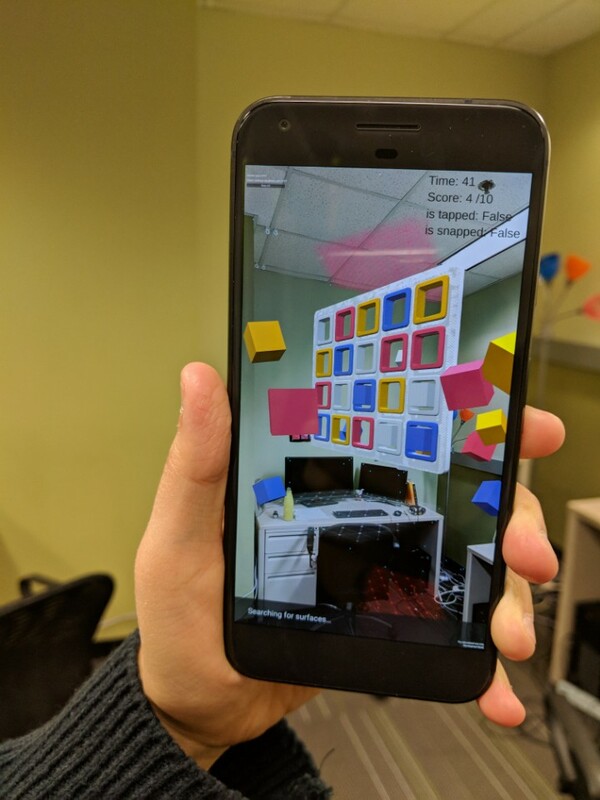 Can Augmented Reality be used to improve relationships? 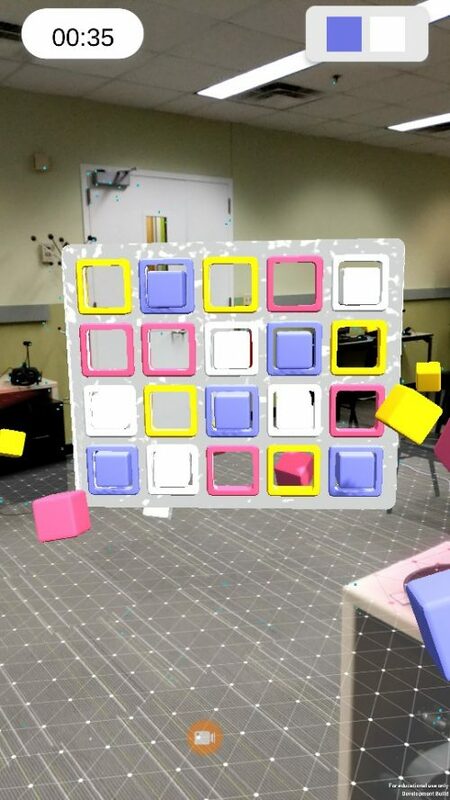 Verizon approached us with the prompt, "explore the space of human relationships and see how they can be enhanced using augmented reality"
Brick, a 2-player augmented reality mobile game that asks players to complete a pattern on a wall spawned in their space. Player are assigned pieces which they have to pick up individually or by collaborating with the other player. Challenges like bombs, combined pieces and a timer make the game exciting. Both the client and host phone are held together to have a wall spawn in the center of the room. Players are assigned 2 colors each ( top right corner). They can only pick up pieces of the color assigned to them. Each level has a fixed time within which they are supposed to complete the pieces. When a player walks to a piece and they are close enough for it to be picked up, the piece glows and shivers. Player pick pieces by tapping on them. By releasing finger from the screen, a player can release the piece holding. Insert selected piece to a matching color on the wall. 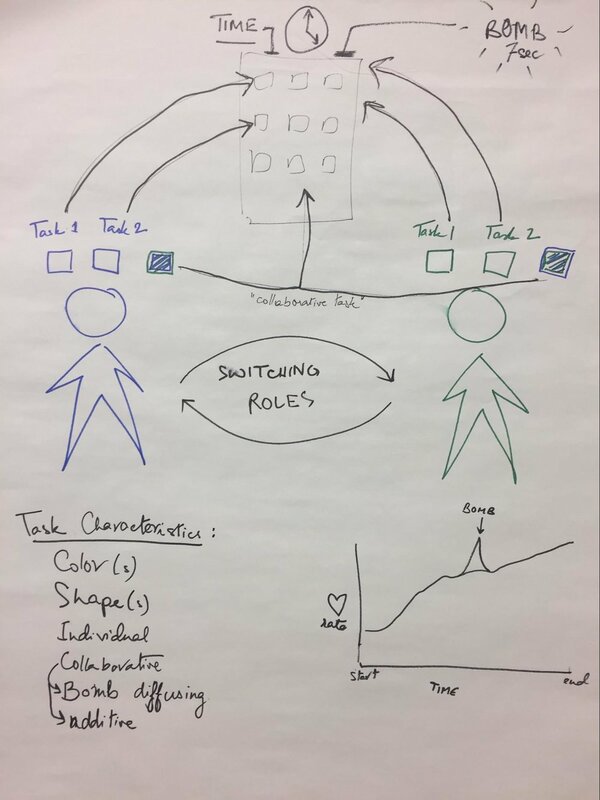 We were guided by the Tandem Transformational Game Design method, a paper written by Jessica Hammer which sets an iterative/ agile design process for games. I led a workshop about the paper and it was based on this method that we designed the entire game.The entire paper can be read here. The starting point for us was to create goals for the game to which each member of the team felt aligned with. 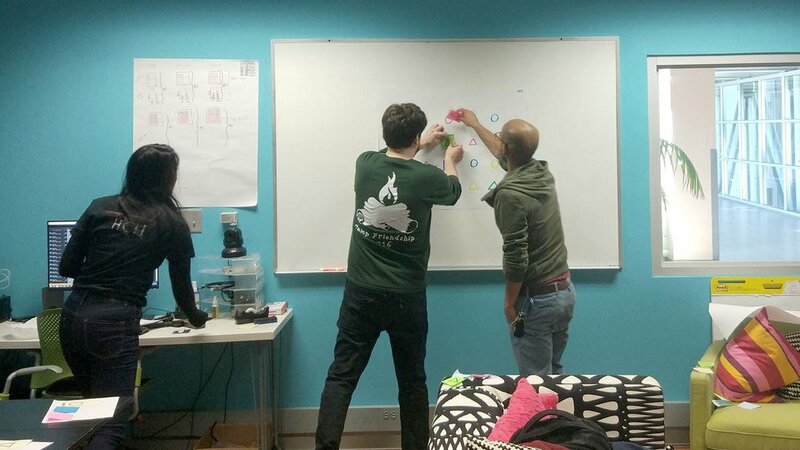 We started by doing ideation sprints like round robin to build on each other's ideas, a landscape analysis to understand the current Augmented reality games and applications and literature reviews. From these sprint we made a list of goals that we voted for and found a common list of goals for the game. Doing multiple rounds of the sprints and goal finding process mentioned above, we settled on these goals for the game. These goals now became the basis of all our following game ideations. We used these 4 goals for designing any game idea henceforth. If the idea was buildable. If it had a good and engaging narrative. If the game mechanics were interesting. At the end of phase one, we shortlisted a list of 4 best ideas and voted for the 3 best which would be carried forward in the prototyping phase. The entire project relied heavily on playtests. Playtests with low and medium fidelity were conducted to understand some of the questions we had below. These playtests helped quickly vet non working ideas and later, interactions before jumping into the high fidelity game. Early on after the selection of the idea, we created a game diagram to understand all the components of the game. The diagram is an overview of all the interactions and challenges that are supposed to take place in the game. WHAT'S IN IT FOR VERIZON? The game is currently being developed in high fidelity in Unity and will be ready as a fully playable version soon.